The painting featured on this page is my most recent piece and represents a new direction in my work. It shows a view of the Athabasca Glacier that I photographed from the Columbia Iceﬁeld in Alberta Canada. 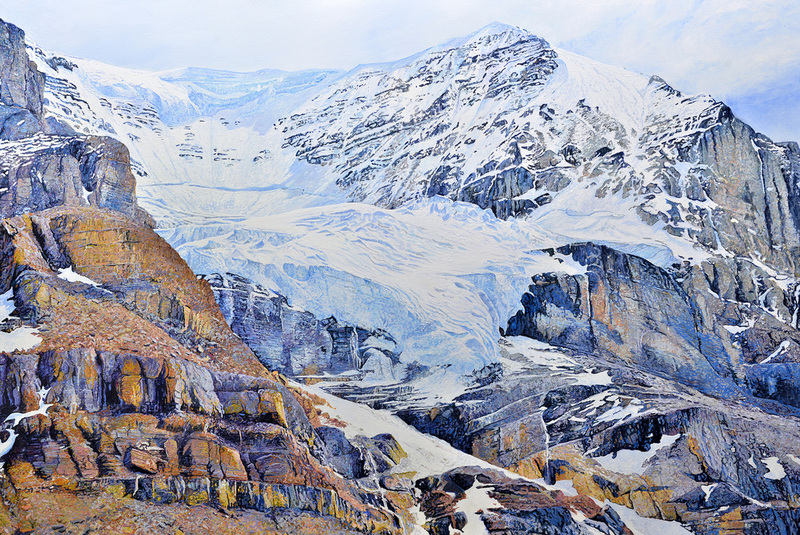 The painting is acrylic on canvas, measures 48" x 72", and is the ﬁrst in my new series that will be devoted to capturing the beauty of mountains and glaciers. Until this most recent piece, my work focused on the natural sunlight world of the Northeast landscape. Paintings range from extreme close-ups of pond surfaces, trees, forest ﬂoors, leaves and ﬂowers, to more encompassing views. Created an acrylic on canvas and watercolor on paper, they explore the visual interaction occurring between streams, ponds and bodies of water with the surrounding landscape environments. Inspired by the interplay and rich diversity of textural surfaces, form and colors within these natural places, especially on water services, my paintings capture close-up views of intimate forest settings. Sometimes tiny worlds of subtle harmonies and rhythms are revealed where the recognizable becomes abstract. Abstraction discovered in the microcosmic is the primary motivation for my ﬂower paintings which are a more recent development and enable be to experiment freely with composition, form, and the painting's physical structure.